Use of AutoIt with selenium webdriver Is very useful because selenium webdriver Is not able to handle windows dialog like file upload dialog, file download dialog, HTTP proxy authentication dialog etc. But AutoIt Is desktop application testing tool and It Is very stable with handling all these kind of dialog. 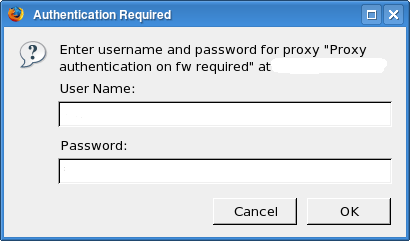 Let's try to work with HTTP proxy authentication dialog. Before reading more In this post, I am suggesting you to visit bellow given pages. It will helps you to understand more about AutoIt script creation and Integration with selenium webdriver. How to create script In AutoIt to upload file. How to Integrate AutoIt script with selenium webdriver to upload file. How to create AutoIt + Selenium WebDriver script to download file. Sometimes when you access site, It will show you HTTP proxy authentication popup as shown In bellow Image. To handle such popups, We can use AutoIt script with selenium webdriver script. Now you are already aware about how to create AutoIt script. AutoIt script to handle HTTP proxy authentication Is as bellow. ; Used Title property of authntication dialog window. It will wait for 8 seconds. ; Send User ID In Used name text field. ; Press keyboard TAB key to move cursor on password text field. ;  Send Passoword In Password text field. ; Press Keyboard ENTER key to select OK button. You need to replace your actual user name and password In above script and then save It with .au3 extension using AutoIt script editor. Then you can convert your script In .exe format by compiling using AutoIt. You can Integrate that .exe file with selenium webdriver script to handle HTTP authentication Using AutoIt.